Stop accepting the status quo of paying more for less when it comes to employee benefits and healthcare! 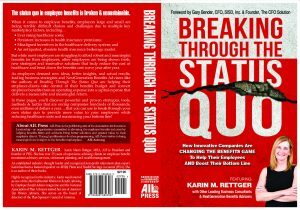 As employers demand new ideas, better insights, and actual results, leading business strategists and NextGeneration Benefit Advisers like the authors of Breaking Through The Status Quo are helping their employer-clients take control of their benefits budget and convert employee benefits from an operating expense into a capital expense that delivers a measurable and meaningful return. Proven methods to help employers manage costs, maximize capital and drive dollars to the bottom line. Doing More with Less is the playbook for any business leader who has questions about employee benefit related issues and understands the necessity of planning for and dealing with them now. Doing More with Less features Karin Rettger on “Retirement Readiness” along with other experts and authorities to reveal methods that will help any employer in determining the proper direction for their organization to ensure costs are managed, the investment in human capital pays off and ultimately, the company can drive dollars to the bottom line.